After numerous requests we found a chiller to compete with the other iceless engine chillers on the market. We heard multiple stories of the other chiller not being able to keep up with demand as the race day progressed and time between runs drew shorter, due to it’s design you are left with nothing to do but wait. 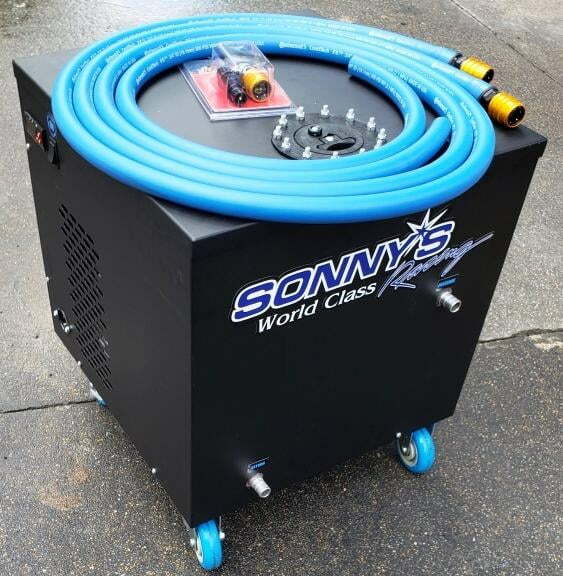 The goal was to make the best engine chiller on the market. The first step was to beef up the cooling capacity of the refrigeration system, but they didn’t stop there, they also use a much bigger reservoir which will help “bank” all that extra cooling capacity. Solid rubber casters to easily move the unit around, 2 have brakes to keep the chiller in place when desired.